The government intends to strengthen its cooperation with African countries that share the Nile Basin, he said. This announcement comes after severe tensions in recent months over the construction of Ethiopia’s renaissance dam over the Nile. Egypt, which relies on the Nile for about 90% of its freshwater needs, argues that tampering with the river’s flow would put millions of farmers out of work and threaten the country’s food supply. In Ethiopia, engineers estimate that the GERD will produce about 6,450 megawatts of electricity, a hydropower jackpot that would boost the country’s aspirations to attain middle-income status by 2025. 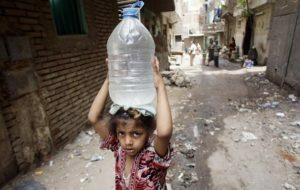 A part of the $50 investment in the water sector, Egypt is also investing in desalination, particularly for its ongoing real estate projects in Upper Egypt. The Government plans to build a $75 million seawater desalination plant in the future city of New Mansoura. Written by: KanelkaTagba on April 11, 2019. Posted by KanelkaTagba on Apr 11 2019. Filed under Finance, Headlines, World News. You can follow any responses to this entry through the RSS 2.0. Both comments and pings are currently closed.